That Batman sleeping bag from Target is great for sleepovers at Grandma’s house, but it’s not going to cut it outdoors when the temperature drops at night. To ensure your kids thoroughly enjoy the outdoors and look forward to every family camping trip, you’ll want to invest in a premium sleeping bag that can handle the cold. The good news is there are plenty of quality kids sleeping bags to choose from, and that investment won’t cost as much as you think. In fact, we’d say it’s pretty affordable to outfit your munchkin with a top-tier sleeping bag, even if you splurge on one of the best. There are several kids sleeping bags with an adjustable cinch-down system that easily adapt to toddler size. That said, it’s nice to have a dedicated toddler sleeping bag that doesn’t require any adjustments. You’ll have to upgrade to a junior-size kids bag eventually, but if you spend a lot of time outdoors your toddler’s sleeping bag may need replacing sooner than later anyways. Here are our favorite toddler-size sleeping bags, starting with the crowd-favorite from Big Agnes. Big Agnes has a solid line of kids sleeping bags with options for toddlers, juniors, and teens. The company’s Little Red 15 is designed specifically for toddlers under 4’5”. 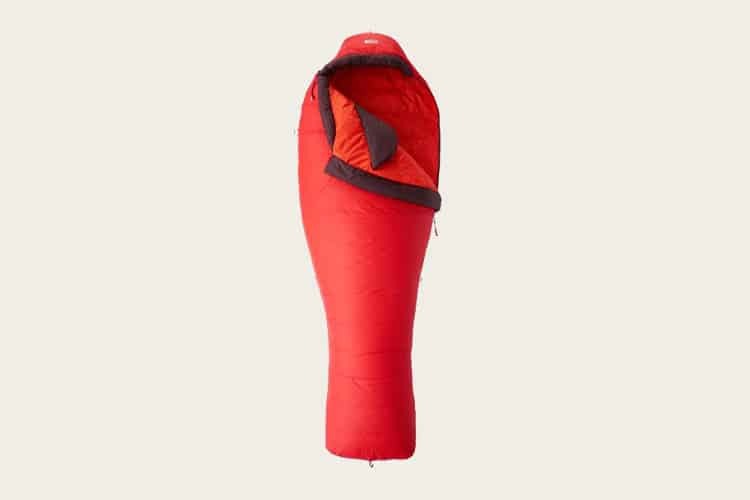 Boasting premium features that are normally reserved for adult gear, the Little Red 15 takes the cake for the best toddler sleeping bag on the market. First, let’s talk about how warm your little tater tot will be. The Little Red 15 combines a thermally-efficient mummy design with premium M4 synthetic insulation for maximum warmth. There’s a contoured hood that follows that shape of your toddler’s head for a comfortable, snug fit, and a low-profile cord lock that lets you un-cinch the hood single-handed. Finally, the Little Red 15 locks out the cold with a no-draft collar, no-draft wedge, and no-draft zipper. The result is a temperature rating of 15℉ — ten degrees better than competing toddler sleeping bags. While the sculpted contour of the mummy bag drapes around your toddler for optimal insulation performance, it still delivers a roomy sleeping space that isn’t too constricting. It’s great for wiggly kids thanks to the integrated full-pad sleeves, which you can attach to your toddler’s sleeping pad at night to lock them in place. The Little Red 15 combats moisture and tears with a DWR polyester ripstop shell. It also features liner loops, exterior loops for hang drying, a zipper garage, a nylon stuff sack, and a mesh storage sack. The Kelty Woobie 30 is an excellent starter bag for toddlers and small children up to 4’ tall. With fun color options for boys and girls, it’s one of the few kids sleeping bags that you can coordinate to match their sense of style. 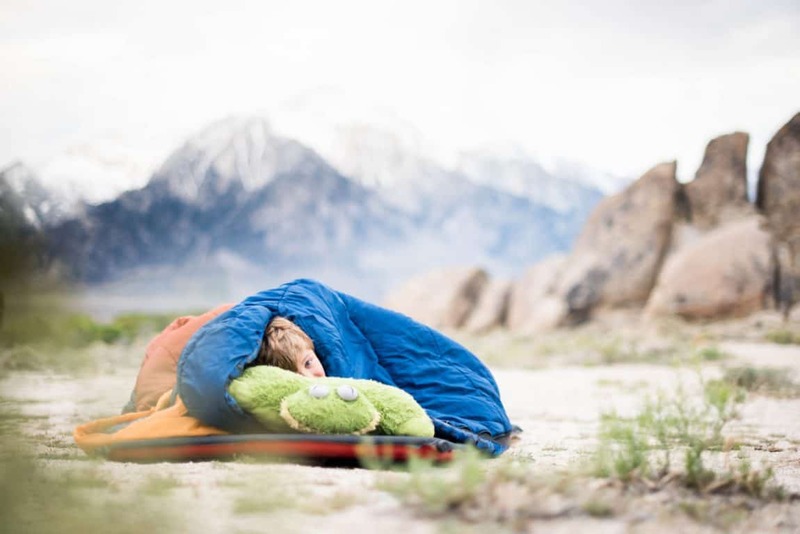 The Kelty Woobie 30 is designed to eliminate those painful moments where you feel like you’re stuffing your little one into a burrito. 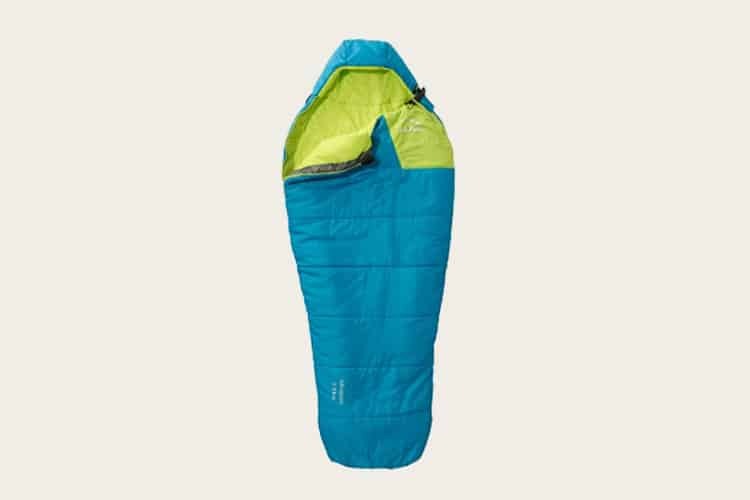 There are double zippers on both sides of the sleeping bag, providing plenty of wiggle room to slide in comfortably. 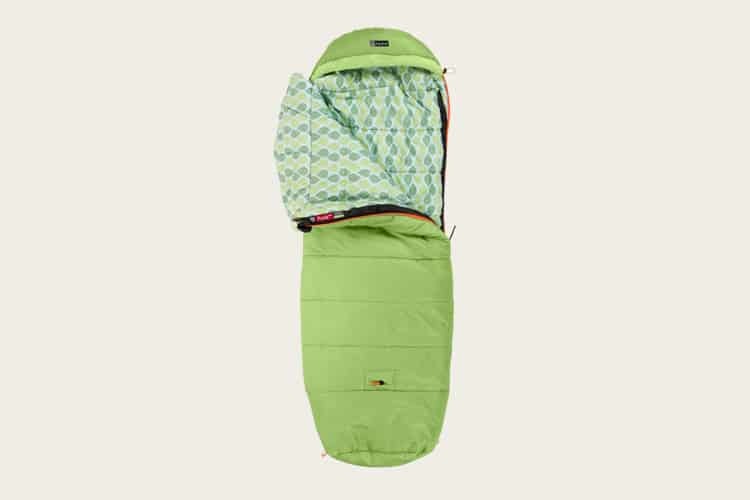 As a mummy bag, the Kelty Woobie 30 keeps things compact to help your little one fill the space and stay warm. Kelty’s proprietary Cloudloft™ insulation seals in the heat with soft, high-loft warmth that’s rated down to 30℉. 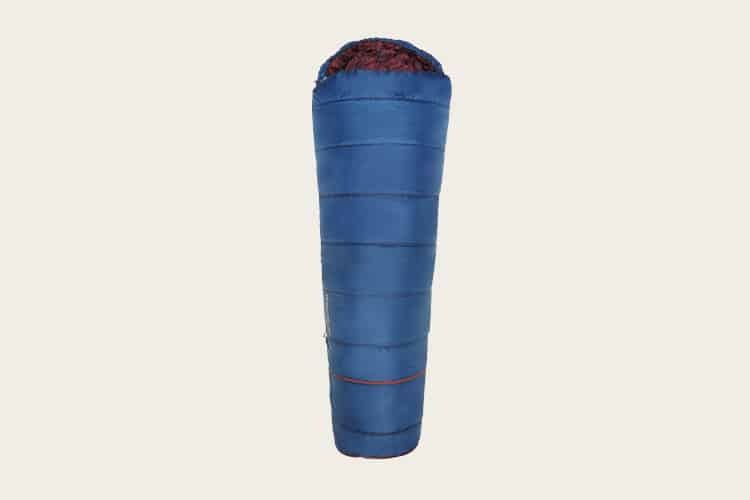 Unlike many of the bulky kids sleeping bags you’ll see out there, the Kelty Woobie 30 is highly compressible. It packs down to 9” x 15” with the included stuff sack, and it weighs just a little over two pounds. L.L. Bean is known for reliable outdoor gear that’s built for wet and rainy weather, and their Kids’ Adventure Sleeping Bag is no exception. It’s a little pricier than the average toddler sleeping bag, but it’s a solid investment if you’re looking for long-lasting durability. The Kids Adventure Sleeping Bag offers more internal space than the typical mummy bag, so it’s great for wiggly kids. The sleeping bag is built with soft, durable 20D ripstop nylon from top to bottom, and features double zippers on both sides. The right zipper extends ¾ down the sleeping bag, while the left zipper extends halfway down for better ventilation and easy access. There’s also a convenient exterior chest pocket where your toddler can store their glasses or headlamp. The Kids Adventure Sleeping Bag features synthetic ST2 insulation that stays warm when wet and doesn’t clump. The insulation is sewn in overlapping baffles to eliminate cold spots. Thanks to superior insulation and baffling, this sleeping bag will keep your toddler warm down to 25℉. Whether you’re looking for an adaptable kids sleeping bag that can grow with your child or just a durable sleeping bag that they can use and abuse before upgrading to a bigger size, we’ve got you covered. Our favorite kids sleeping bags are warm enough for three-season adventures, and they’re packed with premium features to ensure your little one is as comfortable as possible. The Big Agnes Duster 15 is one of the only kids sleeping bags that lets you size up and down for the perfect fit. It’s large enough to fit a teenager up to 5’ 6” with a 62-inch shoulder girth, and you can cinch down the length and width to fit a toddler using the loop and closure system. It’s one of the few kids sleeping bags with the capacity to outfit your kids from the time they’re a toddler until they’re ready for an adult-size sleeping bag. Cold weather isn’t an issue with the Duster 15. The mummy shape is naturally efficient, but the ability to cinch down the sides and length take that efficiency to the next level. The design completely eliminates extra air space and potential cold spots, while the M4 synthetic insulation and shingled construction traps all of the body heat inside. The Duster 15 features a no-draft zipper, no-draft wedge, and no-draft collar to keep cold air from sneaking in. To top it off, the contoured hood follows the shape of your head for a comfortable fit. The low-profile cord lock makes it easy for your little one to uncinch the hood single-handed. To keep your wiggly little kiddos from sliding off their sleeping pad at night, the Duster 15 includes an integrated half-pad sleeve that attaches to the sleeping pad at the hips. This keeps your child firmly in place, while allowing plenty of wiggle room for their legs to move freely. The Duster 15 is constructed with a durable DWR polyester ripstop shell, and a soft, cozy polyester lining inside. 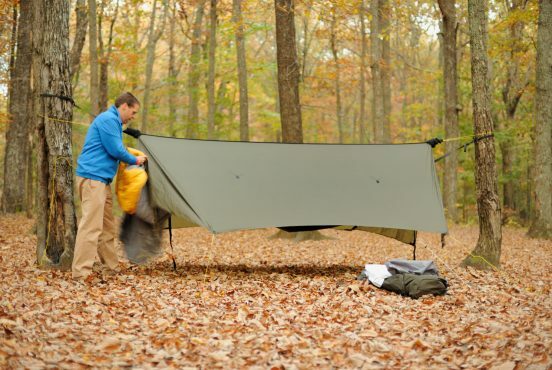 The sleeping bag also features liner loops, a zipper garage, a nylon stuff sack, a mesh storage sack, and exterior loops for hang drying and storage. 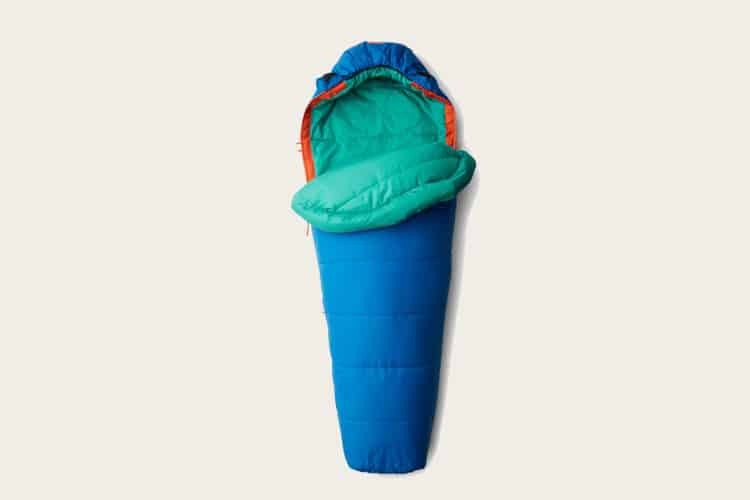 The REI Co-op Radiant 20 Sleeping Bag is the unicorn of kids sleeping bags. 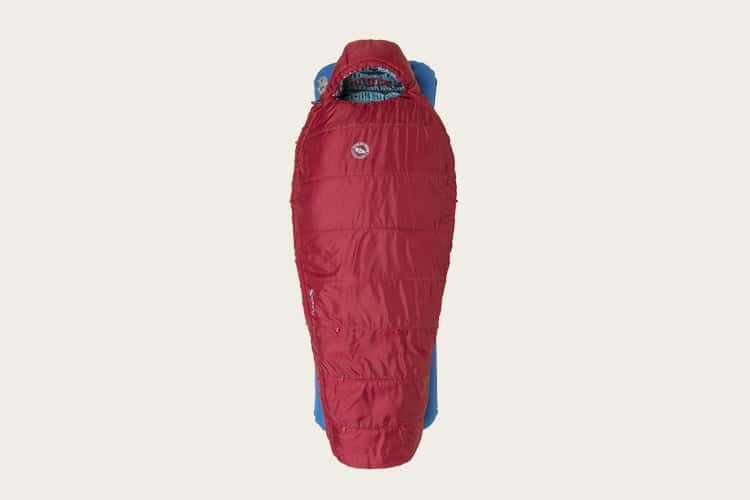 Instead of following the pack with synthetic insulation and polyester materials, this premium sleeping bag uses 600 fp duck down and durable nylon fabric. It’ll keep your kiddo warm down to 20℉, and is built to last for years of outdoor adventures. Thanks to the duck down insulation, the Radiant 20 Sleeping Bag is incredibly lightweight, warm, and compressible. The down is treated with a DWR finish, making it fully water repellent. To maximize the premium insulation, the sleeping bag employs special baffle spacing that maintains loft and prevents down-shifting. The equal distribution of insulation around the entire bag prevents cold spots, and is ideal for sleepers who move a lot throughout the night. 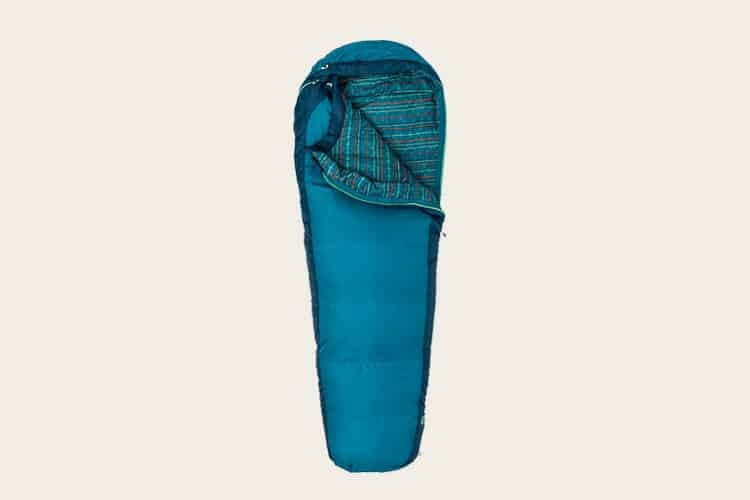 Speaking of moving around, the Radiant 20 Sleeping Bag offers pad loops that you can use to attach the sleeping bag to your child’s sleeping pad. The sleeping bag features a relaxed fit for comfort with plenty of space to move around, while the pad loops ensure your child doesn’t get too wiggly and slide off the pad at night. 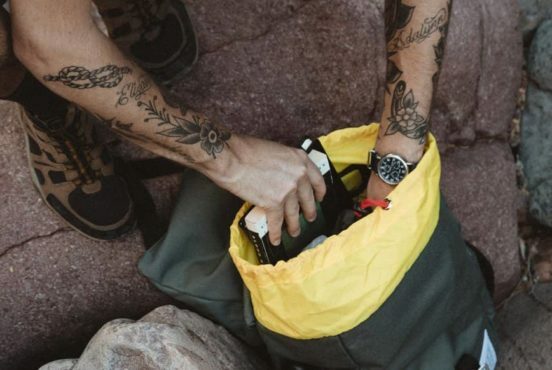 The Radiant 20 Sleeping Bag is constructed with a DWR nylon ripstop shell that effectively resists stains, water, and abrasions. On the inside, there’s a smooth nylon taffeta lining that’s comfy and cozy. 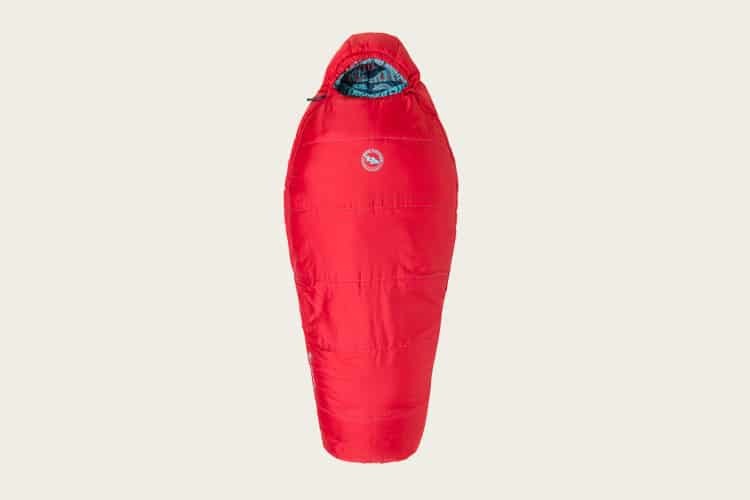 The Radiant 20 Sleeping Pad has a contoured pillow-friendly hood, an insulated full-face muffler, and a full-length draft tube. There are two differentiated drawcords for the neck and hood, making it easier to adjust either in the dark. The full-length zipper is backed by wide, anti-snag binding tape. The bag comes with a stuff sack for the trail, and a nylon mesh storage bag for optimal storage at home. Weight: 2 lbs 2 oz. The Kelty Big Dipper 30 delivers the best value for a kids sleeping bag in two ways. The price is refreshingly affordable, and the bag itself is designed to grow with your child. The base length of 4’4” is great for toddlers and juniors, and when your little one reaches the end you can simply unzip the spiral zipper at the foot to extend the base length a foot to 5’4”. 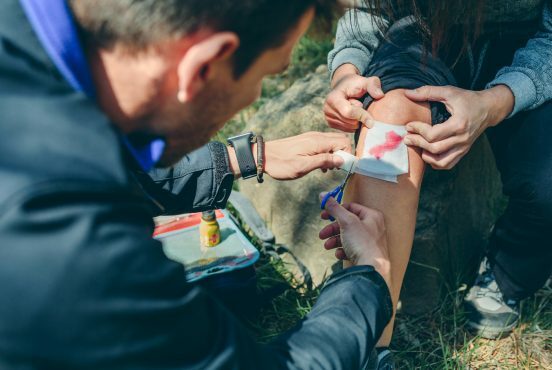 The Kelty Big Dipper 30 combines an energy-efficient mummy shape with Cloudloft™ synthetic insulation to deliver a temperature rating of 30 degrees. Chilly breezes won’t be an issue thanks to the elastic drawcord around the neckline and the full-length draft tube inside the sleeping bag. The Kelty Big Dipper 30 is built with a comfortable and durable polyester taffeta shell and liner. The three-pound sleeping bag stuffs into a 10” x 16” stuff sack, so it’s easy to transport. The NEMO Punk Kids Sleeping Bag is a feature-rich bag that’s brimming with personality. Designed for kids age 4-8, it’s the perfect starter bag to instill a love for the outdoors in your kids from an early age. The NEMO Punk includes a few thoughtful touches that make sleeping outside comfortable and exciting for kids. First, there’s the FuzzTech™ teddy bear fleece surrounding the hood for soft comfort around the face. Next is the Blanket Fold™ draft collar that imitates the comfortable feel of being tucked in bed back home. Finally, there’s a fun, fresh nature theme on the lining that coordinates with the colorful exterior. The NEMO Punk is rated to 20℉ thanks to NEMO’s Stratofiber™ insulation. The synthetic insulation offers the ideal blend of moisture resistance, warmth, and packed volume. 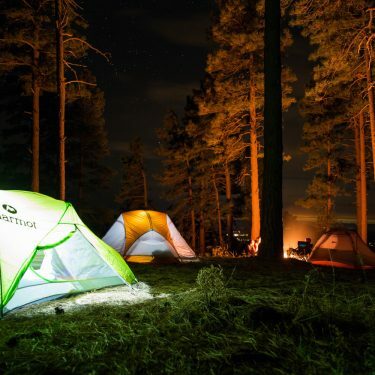 It’s also fully machine-washable, making laundry a breeze after a weekend camping trip. The NEMO Punk includes an integrated pad sleeve that fits most 20-inch sleeping pads, helping your little one stay centered on their sleeping pad all night. To ensure the perfect fit, you can use the cinch adjustment system to size-down or size-up as your child grows. The Marmot Kids Trestles 30 is a roomy, mummy-style synthetic sleeping bag that performs well in cold and damp conditions. The bag uses Marmot’s proprietary Spirafil™ high-loft insulation, a unique blend of large, spiral hollow fibers and small polyester fibers. The synthetic insulation delivers the exceptional heat retention, comfort, and compressibility of down insulation, with the added bonus of improved moisture resistance. 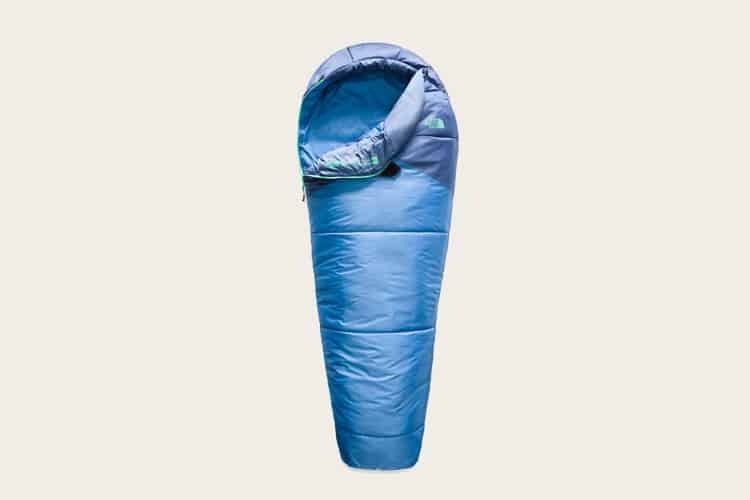 Up top, the sleeping bag features a 3D hood with a drawcord that’s easily adjustable to optimize heat retention. The upper portion of the body is built for maximum warmth and loft, while the bottom portion retains a blanket-like feel that’s great for kids. At the bottom is an anatomical, trapezoidal footbox that minimizes heat buildup while providing plenty of space to stretch your feet, wiggle your toes, and find a comfortable sleeping position. 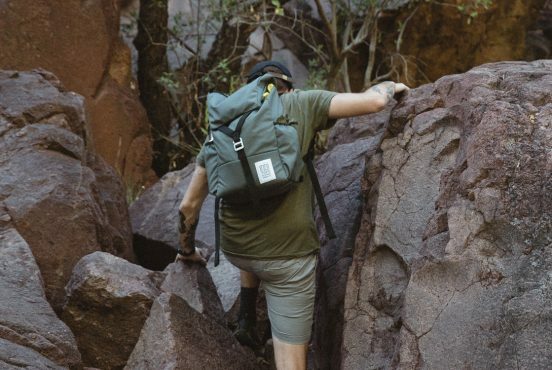 The Kids Trestles 30 features an interior stash pocket, a snagless draft tube, “feely” draw cords, and a fold-down second zipper for easy access and ventilation. The bag includes dual hang loops for drying and storage, and a compressible stuff sack for improved portability. The Youth Aleutian 20 from The North Face is a versatile, durable mummy bag that’ll keep your little ones toasty warm from Spring to Fall. The sleeping bag features Heatseeker™ Eco synthetic insulation that’s composed of 30% recycled material, so it’s warm and eco-friendly. There’s a draft collar to trap body heat inside the sleeping bag, and a vaulted footbox to keep little feet and toes warm all night. The wraparound zipper on the footbox helps the bag lie flat, which limits cold air pockets that tend to form around the feet. The Youth Aleutian 20 is designed with a roomy, comfort-oriented cut that’s great for kids who don’t like feeling restricted when they sleep. The short-side zipper helps the bag act and feel like bedding at home, and you can unzip the bag to function like a comforter on warmer nights. 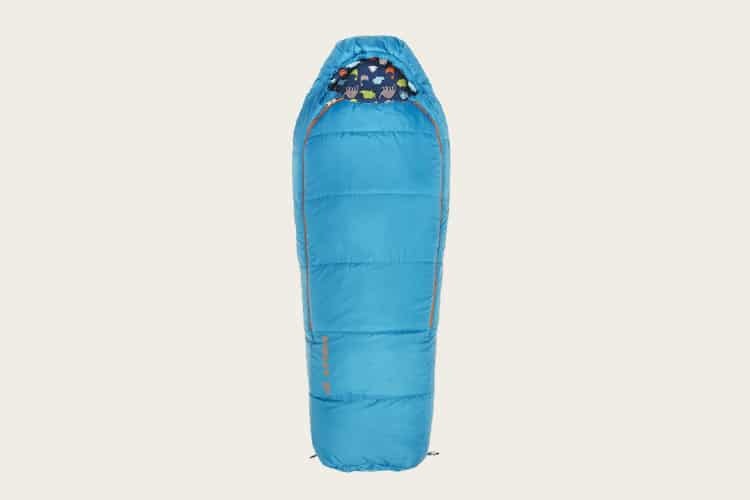 Designed for the growing backpacker, the lightweight and compact REI Co-op Nodder 25 is a solid three-season sleeping bag for kids age 6-10. The base length is enough for kids up to 5-feet-tall, and you can use the attached stuff sack to shorten or lengthen the bag as your child grows. The Nodder 25 is rated down to 25℉ thanks to its cozy synthetic insulation and shingle construction with overlapping layers. The design eliminates cold spots, and the even distribution of insulation makes it comfortable for any sleeping position. Both zippers are backed by full-length draft tubes and there’s a close-fitting hood with a stretchy opening around the face for a comfortable, kid-friendly fit. Like the Big Agnes sleeping bags that we’ve discussed, the Nodder 25 includes pad loop attachment points so you can strap your child’s sleeping bag to their sleeping pad. The sleeping bag also features dual-side zippers with hook-and-loop closure tabs so your little one can pull their arms out for reading or games while keeping their body inside the bag. Given the price point, it’s impressive that the Nodder 25 features a durable ripstop nylon shell (at this price point you usually see polyester). The shell is lightweight, durable, water resistant, and abrasion resistant. Inside, the nylon taffeta lining is soft and tear-resistant. Kids sleeping bags are pretty straightforward, but the manufacturer’s temperature ratings can be a little confusing. Many parents find themselves asking how comfortable their child will be at the stated temperature, and whether that’s a hard limit or if there’s some wiggle room. Generally speaking, the temperature rating on a sleeping bag refers to the product’s lower limit. Your child will survive temperatures this cold, but they probably won’t be 100% comfortable. To estimate the comfortable range, it’s a good rule of thumb to add 10 degrees to the lower limit. That means a sleeping bag with a rating of 15℉ should be comfortable down to 25℉, and a sleeping bag with a rating of 30℉ should be comfortable down to 40℉. 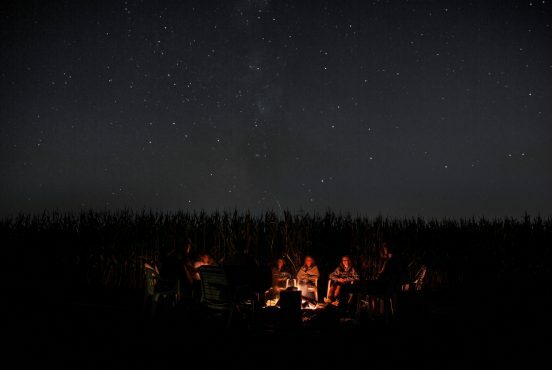 For summer camping trips, a temperature rating of 40℉ is usually a safe bet. 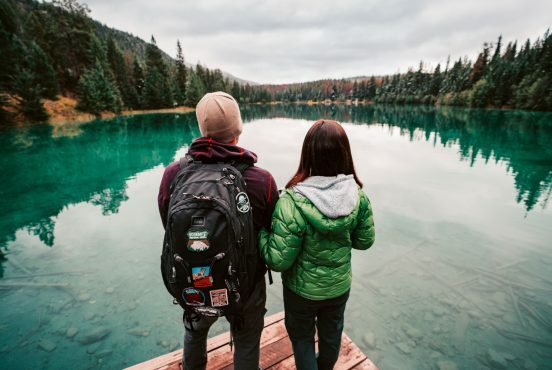 During the spring and fall it’s important to prepare for freezing temperatures, so you should look for a bag with a comfortable range of 20℉ to 30℉. Kids tend to sleep colder than adults, so it’s important to consider the comfortable range vs the lower limit. The point of investing in a nice kids sleeping bag is to help your little one discover a love for the outdoors, but that’s difficult to do if they’re shivering cold all night while missing their comfy bed back home. Parents, if you’re looking to upgrade your backcountry sleeping setup, check out our favorite ultralight sleeping pads, the best ultralight sleeping bags and some of the top backpacking pillows for restful nights. After a long day of hiking or traveling in bulky shoes or boots, not much feels better than slipping on a pair of comfortable lightweight camp shoes. Here's how to do it right. 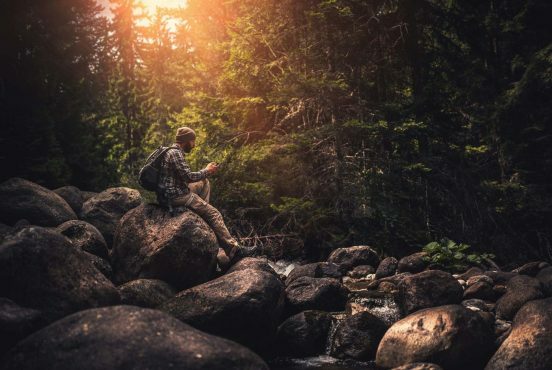 AllTrails and Gaia GPS are two of the leading trail apps out there, and they both have loyal fanbases. Here's how to choose which may be best for you. 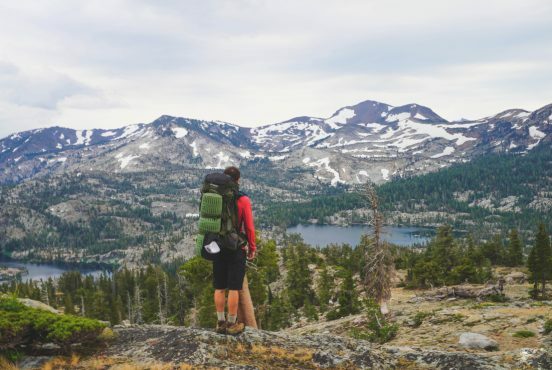 No matter how long or rugged the journey, every hiker needs a solid, trusty hiking backpack to get out and get going — even on a budget.